The next generation user expects more do-it-yourself IT offerings. Whether it’s self-service portals with interfaces to rival Amazon or personal mobile devices with 24/7 business access, users are requesting more self-service functions and capability. To the modern user of technology “consumer-grade” has become a standard, and it’s ITs’ job to not only appease but genuinely satisfy contemporary users. 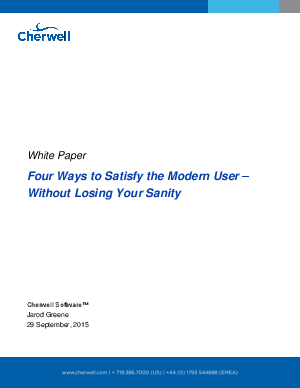 This research highlights four ways to satisfy the modern user who brings their own knowledge, devices, applications and technical expectations to the workplace.